The Senate demanded that the president turn over a document. The president—in the second year of his second term—refused. In an unprecedented and never-repeated tactic, the Senate then censured the president on March 28, 1834. 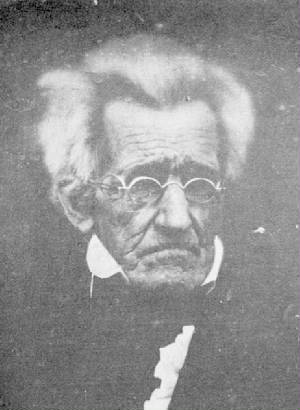 Two years earlier, President Andrew Jackson had vetoed an act to re-charter the Bank of the United States. That veto became a major issue in his 1832 reelection campaign, as he decisively defeated Senator Henry Clay. After the election, Jackson moved to withdraw federal deposits from that bank. When the new Congress convened in December 1833, Clay's anti-administration coalition in the Senate held an eight-vote majority over Jackson's fellow Democrats. Clay then challenged Jackson on the bank issue with a Senate resolution seeking a paper the president had read to his cabinet. When Jackson refused, Clay introduced the censure resolution. After a ten-week debate, the Senate voted 26 to 20 to censure the president for assuming power not conferred by the Constitution. Jackson responded with a lengthy protest denying the validity of the Senate's action. In another unprecedented move, the Senate responded by refusing to print the president's message in its journal. For nearly three years, Missouri Democrat Thomas Hart Benton campaigned to expunge Jackson's censure resolution from the Senate Journal. By January 1837, having regained the majority, Senate Democrats voted to remove this stain from the record of an old and sick president just weeks from his retirement. With boisterous ceremony, the handwritten 1834 Journal was borne into the mobbed chamber and placed on the secretary's table. The secretary took up his pen, drew black lines around the censure text, and wrote "Expunged by the order of the Senate." The chamber erupted in Democratic jubilation and a messenger was dispatched to deliver the expunging pen to Jackson. Dressed in the deep black of a mourner, Henry Clay lamented: "The Senate is no longer a place for any decent man." Sources: Peterson, Merrill D. The Great Triumvirate: Webster, Clay, and Calhoun. New York: Oxford University Press,1987; Remini, Robert V. Andrew Jackson and the Course of American Democracy, 1833-1845. New York: Harper & Row, 1984.